B Strong is one of the industry’s safest Blood Flow Restriction (BFR) training systems. (BFR) training is an exercise technique that manipulates the body’s circulatory system. When combined with exercise using light loads, it produces rapid gains in strength and fitness similar to high intensity strength training in a very short period of time. BY USING PROPER EQUIPMENT AND FOLLOWING PROPER GUIDANCE AND SAFETY RULES, YOU CAN EXPERIENCE THE AMAZING BENEFITS OF BFR. PORTABILITY = strength training can be done anywhere. UN-TETHERED TRAINING = ability to do sport-specific training for functional strength gains. The industry used to think in terms of exercising a muscle to improve that muscle’s fitness. Prevailing wisdom now thinks of exercising a muscle to elicit a systemic response, which improves all tissues involved in the exercise. Further, it was previously thought that lifting heavy was necessary to improve strength. Now we know that we simply must create a disturbance of homeostasis in working muscle to improve strength. Rather than lifting heavy to do that, we can lift light while restricting our blood flow to those muscles. Low loads means less risk of musculoskeletal injury from the training session. Less damage to the muscles and joints means quicker recovery times and less soreness following BFR training. In fact, sometimes no soreness at all is experienced the next day. Because the hormonal response is systemic, meaning that the hormones in your circulatory system touch all parts of your body, all tissues that were working get the benefit and gain strength, not just the muscles on the limbs with the belts. GET LEAN. Many people don’t want to get BIGGER, but do want to get lean and strong. This requires a combination of workout routines and nutrition, not only what is done with (B)STRONG Training. BFR is a breakthrough in understanding how the body adapts to training stress and builds muscle, bone, blood vessels and tendons. The B STRONG BFR System works by slowing down or impeding the flow of blood exiting the limbs through the veins. As your muscles work, they use up available oxygen and other nutrients and normally this circulation brings more oxygen and removes metabolic waste products. Because the circulation has been impeded, there is not enough re-supply of oxygen to the muscle, nor enough clearing of metabolic waste products. The “environment” of the muscle fiber deteriorates to the point where muscle contraction cannot continue and other muscle fibers have to take over to perform the exercise. Soon, all fibers in the muscle go into a state of “failure” and the person working out cannot continue. They recognize this state as muscle burn or fatigue followed by not being able to do anymore repetitions. The brain senses the distress and responds, as it normally does, by initiating autonomic and hormonal responses in an attempt to mitigate the conditions in the muscle and to adapt to the demands of the exercises. This process is the normal process of adaptation to severe exercise. To get to this state, one must usually perform severe exercise like maximal weight lifting or many running intervals. This type of severe exercise often damages the tissues involved. In the case of BFR Training, the situation was created by a combination of light, otherwise easy exercises but with the blood flow to those muscles impeded. As a result of the distress in the muscle, growth hormone and other anabolic hormones are released into the blood stream. This hormonal cascade goes throughout the body and facilitates the repair and building of all tissues that have been working or were injured. 1. LIGHT WEIGHTS + BFR PRODUCES PROFOUND MUSCLE FATIGUE. 2. NERVOUS SYSTEM COMMUNICATES FEELINGS TO BRAIN (MUSCLE BURN). 3. PITUITARY RELEASES GROWTH HORMONE. 4. ANABOLIC HORMONES CIRCULATE IN BLOOD STREAM. 5. THE ANABOLIC HORMONE RELEASE FACILITATES REPAIR AND INCREASE STRENGTH IN ALL EXERCISED TISSUES. This is a simplification of the complex theory of the mechanism behind BFR. Additional materials are available to all our clients. For example, the graph on this page shows the ANABOLIC HORMONAL RELEASE as documented by a robust increase in circulating growth hormone levels (GH) 30 minutes after a BFR session, where the same exercise without BFR produces no increase in GH levels. The field of blood flow restriction training continues to evolve, and our mission is to keep you informed of the latest developments. The major finding of this study is that BFR training performed with light weights is as effective as standard heavy weight training to improve strength, while just using the same light weights alone without BFR was not able to improve strength. Panel A represents significant positive gains in strength from a training program where traditional heavy weights (80% of 1RM) were used. Panel B shows the same positive results from a BFR program with lighter weights (50% of 1RM). Panel C shows no significant results from a program using the same lighter weights, but without BFR. Panel D shows the results of repeat testing on individuals not training. In all the panels, we see the elbow flexor (arm curls) torque generated at a range of movement velocities. The lines or curves with the open circles represent testing data prior to a 32 session training program, while the filled circles represent the testing data after the 32 session program. Panels A, B, C, and D describe the results of 4 different training programs. A team of world class engineers, doctors, and coaches have conducted thousands of BFR sessions to affordably achieve the optimal product, algorithms and application guidance. DOES BLOOD FLOW RESTRICTION TRAINING REALLY WORK? . . . Multiple research labs in independent studies have reported that BFR training produces strength gains similar to maximal resistance training (weights). 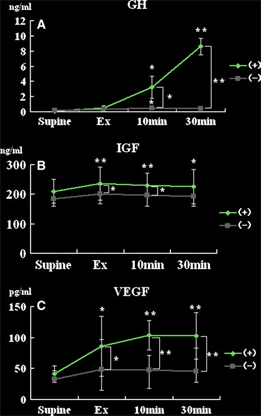 It is important to note that not all BFR techniques and products are created equal. (B)STRONG’s proprietary equipment keeps you safe, while making the experience simple, effective, and fast to use. HOW LONG WILL IT TAKE TO SEE AN EFFECT? . . .
By using B STRONG equipment and the guidance app, you should see a marked improvement on the order of 10% strength gains in as little as 10-15 sessions if done 3-5x per week, 1x per day. Because each individual is different, our application is designed to keep you safe and work your way toward the pressures that are appropriate for you. B STRONG is much more than just the equipment. We provide expertise in an easy to implement fashion so you can simply Pump up ‘n Go. WHAT IS THE DIFFERENCE BETWEEN (B)STRONG BFR TRAINING AND NORMAL RESISTANCE TRAINING? . . .
B STRONG BFR Training provides a more robust anabolic stimulation with lighter weightsin a shorter period of time and in a safer manner than normal resistance training. Gains in fitness and strength are realized quicker with (B)STRONG BFR Training than with normal resistance training. WHAT ARE THE SIDE EFFECTS OF (B)STRONG BFR TRAINING? . . . Always use the (B)STRONG guidance app. Of course, if there is an ongoing medical emergency (e.g. heart attack, hypertensive crisis, hypoglycemic reaction, stroke, acute injury, etc. ), the individual should postpone the (B)STRONG BFR Training session and seek medical attention. WHAT ARE THE EFFECTS OF (B)STRONG BFR TRAINING ON THE HEART? . . . 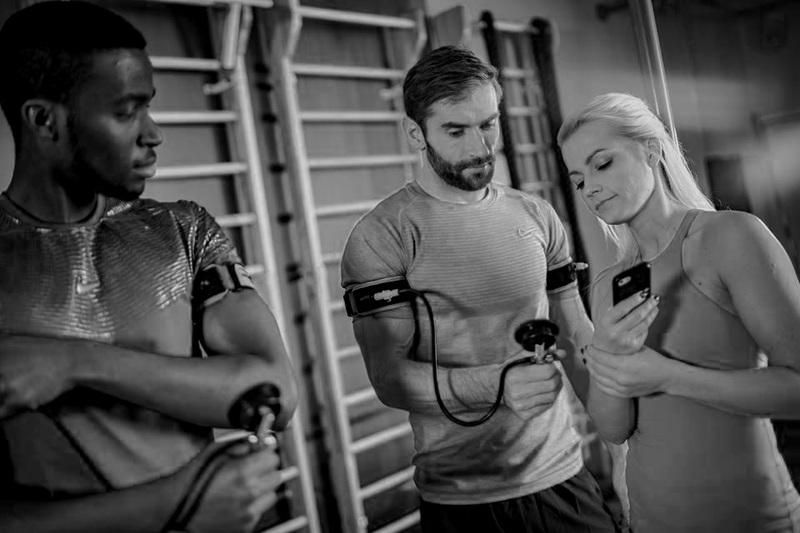 Acutely, during a BFR training session, heart rate and blood pressure are somewhat higher than they would otherwise be for the given exercise. Chronically, BFR training has many positive effects on the cardiovascular system, including the heart, similar to the positive effects gained from regular exercise training. CAN DOING (B)STRONG BFR TRAINING LEAD TO PULMONARY EMBOLISMS OR BLOOD CLOTS? . . .
Not if the 5 safety rules are followed. If blood in deep veins is brought to a standstill for a prolonged period of time, the blood can begin to form clots. If this happens and the clots move into the lungs, they will cause what is called a pulmonary embolis. If big enough, pulmonary emboli can be fatal. Fortunately, the (B)Strong BFR Belts are designed so that when the safety rules are followed, they cannot make the blood stand still long enough to clot, and thus, (B)STRONG BFR Training does not increase the risk of blood clots or pulmonary emboli. Millions of BFR sessions have been performed world wide over the last 50 years and where it has been studied, the individuals who practice BFR have less blood clots detected than a matched group of individuals who don’t do BFR training. Some individuals are genetically predisposed to clotting. By the time these individuals are adults, they know whether they or others in their families have this condition. Often they are on anticoagulants. (B)STRONG BFR Training is safe even for these individuals. Sometimes, after particular types of surgery (e.g. various orthopedic procedures on the lower extremities), one may have formed clots in the veins while anesthetized. These clots may go unrecognized and cause a pulmonary embolus in the days following the surgery. Thus, we recommend waiting a week after surgery to resume or start a (B)STRONG BFR training program. WHAT IS THE RELATIONSHIP BETWEEN MY BLOOD PRESSURE AND THE (B)STRONG BFR SYSTEM PRESSURE? . . . When one uses a blood pressure cuff, or surgical tourniquet, and if it is applied at a pressure higher than systolic blood pressure, occlusion can occur. With those systems, there is an important relationship between cuff pressure and blood pressure. The (B)STRONG BFR Belt, by virtue of the width, construction, and material properties, has been designed so it cannot occlude the circulation. Therefore, from a safety standpoint, the pressures prescribed in the (B)STRONG BFR System pressure has little or no consideration to a person’s blood pressure. The pressure in the (B)STRONG BeltTM restricts or impedes venous blood from returning to the central circulation. The higher the pressure, the more blood is held in the limb and the more the circulation is slowed. The higher the pressure, the greater the muscle force needed to push blood past the impediment and back to the central circulation. In contrast to BP cuffs and tourniquets, the pressure prescribed for (B)STRONG BFR Training has little or nothing to do with the individual’s blood pressure. WHO SHOULD NOT DO BFR TRAINING? . . .
As with any exercise program, all practitioners of(B)STRONG BFR Training should use common sense in deciding if they should proceed with a session. They should consult their physician if they have any questions about their particular circumstances. There are very few situations where people should not use the (B)STRONG BFR System. People should wait one week after major surgical procedures before starting or resuming (B)STRONG BFR Training. This caution is primarily given to allow time for asymptomatic, untreated deep venous thromboses to be identified and treated. People should not put (B)STRONG Belts directly on healing incisions or wounds. If, for example, there is an incision on the outside of the thigh (as in a total hip replacement) where the leg belt would go, the individual should avoid placing a leg belt directly on the incision, but they can enjoy BFR training on the other three extremities. Women who know they are pregnant should wait until after delivery before starting (B)STRONG BFR Training. Note: As with any exercise, if a pregnant woman has been BFR training prior to discovering they are pregnant, there is no need to stop. They may do BFR training, on the easy side, until they feel uncomfortable doing (B)STRONG BFR Training (usually in the last trimester). They should consult their obstetrician if they have any questions or are a high risk pregnancy. If a person’s limb girth in the appropriate belt location is less than 19 cm (7.5”), that limb (usually an arm) is too small for our smallest belts. We have only seen this situation with children weighing less than 60 lbs. They may enjoy (B)STRONG BFR Training on their legs only. If a person’s limb girth in the appropriate belt location is greater than 95 cm (37.5”), that limb (usually a leg) is too large for our largest belt. We have not run into this situation yet, but those individuals may enjoy (B)STRONG BFR Training on their arms only. If someone is having a medical emergency of any sort, he/she should stop BFR training, call 911 and/or go to the emergency room and seek care. People should not operate a vehicle while doing BFR training. However, it is fine for passengers to do so, as long as they do not distract the driver. If a person has a condition that has produced lymphedema, he/she should avoid BFR on that extremity and they should consult their physician before proceeding. If a person has iatrogenic vascular access on an extremity (e.g. hemodialysis patients), he/she should avoid BFR on that extremity and they should consult their physician. If a person has untreated deep venous thromboses, he/she should not do BFR training until they are treated. If a person is in hypertensive crisis or has untreated hypertension, he/she should seek medical attention and then when their hypertension is controlled, proceed with BFR training, after they have consulted their physician. WHAT ARE THE RISKS? . . .
As long as the safety rules and cautions are followed, and (B)STRONG equipment and the guidance app are used and followed, there are no risks associated with (B)STRONG BFR Training beyond those associated with any exercise. Please consult your with your physician before starting any exercise routine, including (B)STRONG BFR Training. WHAT IS OCCLUSION TRAINING AND WHY IS IT DANGEROUS? . . .
Occlusion training involves completely stopping blood flow into an extremity for substantial periods of time. It can damage tissue distal (below) to the occlusion. Completely occluding a limb for a substantial period of time increases the risk of blood clots in veins. Deep venous thromboses (DVT’s) can lead to pulmonary emboli, which can be fatal. Occlusion training can also lead to rhabdomyolysis (severe breakdown of muscle fibers), which can lead to kidney failure and possibly death. (B)STRONG is not occlusion training. WHAT IS THE DIFFERENCE BETWEEN OCCLUSION TRAINING AND BLOOD FLOW RESTRICTION TRAINING? . . .
See the safety video where we compare occlusion training with a blood pressure cuff and (B)STRONG BFR Training. The difference between occlusion training and BFR Training is that with occlusion, the limb’s blood flow is occluded; with BFR, some blood flow is always maintained. IS (B)STRONG BFR TRAINING A FORM OF OCCLUSION TRAINING? . . .
No. If safety rules are followed, (B)STRONG BFR Training does not, totally occlude blood flow in a limb (safety rule #2), which is what occlusion training seeks. IF INDIVIDUALS CAN EASILY WRAP THEIR OWN ARMS WITH BANDS OR SURGICAL TUBING, WHY PURCHASE A (B)STRONG BFR SYSTEM? . . .
Because the (B)STRONG BFR System is designed to be both safe and effective. Surgical tubing or elastic wraps vary tremendously in how they influence the circulation. With surgical tubing or elastic wraps, one has little knowledge of whether they are safe or effective. In addition, (B)STRONG Belts are likely to be much more comfortable than surgical tubing or blood pressure cuffs. (B)STRONG BFR Training emphasizes safety and pays great attention to getting the pressures right. When too much pressure is used, dangerous blood vessel occlusion can result. The application of too little pressure is not effective in producing the benefits of (B)STRONG BFR Training. The patented (B)STRONG BFR Belts are specifically designed to provide a safe, comfortable and effective (B)STRONG experience. WHO USES THE (B)STRONG BFR SYSTEM? . . .
WHAT IS THE BEST WAY TO START (B)STRONG BFR TRAINING? . . . The best way to start (B)STRONG BFR Training is to measure your limb girths, order a system, fill out the requisite information and download the app. The guidance app will take you from there, track your progress, and prescribe appropriate pressures to keep your sessions safe and effective! WHAT TYPES OF EXERCISES CAN YOU DO WITH (B)STRONG BFR SYSTEM? . . .
You can do any exercise imaginable with your (B)STRONG BFR System. The most important point is to follow the guidance of the app. In the app, you should follow the (B)STRONG regimen for sets and repetitions to achieve muscle failure. Any light weight or partial body weight exercises can be performed with (B)STRONG BFR Training. We recommend that the basic exercises described in the app are used first, but gradually, the individual can incorporate exercises most specific to the activities relevant to his/her lifestyle. Examples include cyclists “B-ing” STRONG on a stationary bike with leg bands or baseball players throwing while using the arm bands. WHAT IS THE APPROPRIATE LEVEL OF PRESSURE WHEN DOING (B)STRONG BFR TRAINING? . . . The proper (B)STRONG BFR System pressure varies between individuals depending on a variety of biometric factors. The (B)STRONG guidance app has an algorithm that takes these factors into account. That is why the regular use of the app is very important. The appropriate level of pressure is set by the app and updated based on feedback given after each session.